DocMagic named top 50 service provider for the 12th consecutive year! For the 12th consecutive year DocMagic has been named in Mortgage Technology Magazine’s annual listing of top service providers. 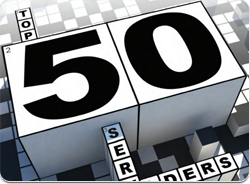 This year the 2013 Top 50 Service Providers are featured in a challenging crossword puzzle along with a hint about each company’s history, products and services. DocMagic named a Top 50 Service Provider for the 11th consecutive year! DocMagic has been recognized by Mortgage Technology Magazine as one of the 2012 Top 50 Service Providers. This marks the 11th consecutive year that DocMagic has been named in the publication's annual listing of top service providers since the award's inception in 2002.